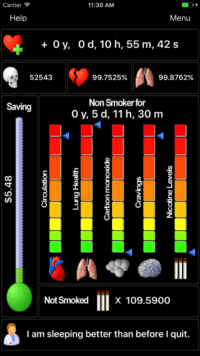 Quit smoking with the help of an app on your phone! These apps offer inspiration, encouragement and actionable tips to make quitting easier and increase your chances of success. The CDC’s QuitGuide app has been researched thoroughly to ensure it helps quitters stay on track and quit smoking for good. Track smoking triggers, get inspiration, monitor your progress and so much more with this interactive tool designed to increase your quitting success. QuitGuide is a product of Smokefree.gov — a smoking cessation resource created by the Tobacco Control Research Branch at the National Cancer Institute in collaboration with tobacco control professionals and smoking cessation experts and with input from ex-smokers. Download it on the Apple App Store for iPhone or Google Play Store for Android devices. My Last Cigarette helps quitters see the benefits of their decision to quit. Download it on the Apple App Store for iPhone.